How container ships have reached mega sizes? Container ships were not always this big . They grew over time, let's find out how. Up until 1956, dock workers were the force responsible for packing international cargo in the holds of vessels, the cargo was also manually unloaded upon arrival at the designated port. In 1937, however, Malcolm McLean, the owner of a North Carolina trucking company, got fed up with the large amount of time it took to carry out the process as he constantly had to wait for workers to pack up his cargo consisting of cotton, that he had trucked up all the way to New York harbor, in order for it to be sent on its way to Istanbul. McLean came up with the idea to employ cranes in order to directly load truck trailers aboard the ship. It actually took him some time to carry out this idea of his but in 1956, the Ideal X debuted – it was the first container carrier, a converted tanker with a capability of transporting 58 containers. In 1957 McLean launched the Gateway City vessel, which was much larger than its predecessor, with a capability of carrying 226 containers, which would be stacked in racks. During the course of 1960s, he was able to launch even larger container ships, and thus it was only natural that his Pan American company began to take over the shipping industry. The system he invented contributed a great deal for cutting down on port time and the level of labor required to load and respectively unload cargo. The containers also served as innovative means for the securing of goods, thus lowering the number of cases involving theft. Other various companies began copying his methods, and as a result shipping containers nowadays have standardized sizes (they now have a standard width of 8 feet, a length of either 20 or 40 feet, and height of either 8.5 or 9.5 feet). By the time the 1970s rolled to an end, the larger portion of consumer goods that were being shipped into the U.S. were coming into the country via containers. With time, the trend resulted into an arms race amongst shippers, due to the fact that larger vessels led to lower shipping prices per container – approximately the same number of seafarers was needed on a vessel despite its size, and on a proportion basis less fuel was needed per container for moving the bigger ones. This resulted in the huge ship growth we have seen occur over the years. In order to be able to properly accommodate these enormous vessels, ports had to be rebuilt, along with bigger yards for storing the containers, and huge cranes for loading and unloading them, as well as highway and rail terminals in order to send them right on their way. The Panama canal is now going through an expansion program in order to be able to provide sufficient accommodations to bigger vessels, but even after the completion of the project which has been scheduled for 2016, it will not be able to handle the current record holder for largest container carrier in the world, the MSC Oscar. It is worth noting that the biggest ships of today are so large that they are not able to dock at any of the U.S.’ ports, so they are employed for shipping purposes only between Asia and Europe and vice versa. Although, if it is to be ever finished, the Nicaragua Canal will actually be large enough to handle the ships in question, and there have also been proposals regarding a potential dredging of the Port of Norfolk, along with other ports, so that the large vessels would be able to dock in the U.S. It is a rather hard task to fully describe in detail the degree in which the above-stated developments contributed for the shaping up of today’s world economy. 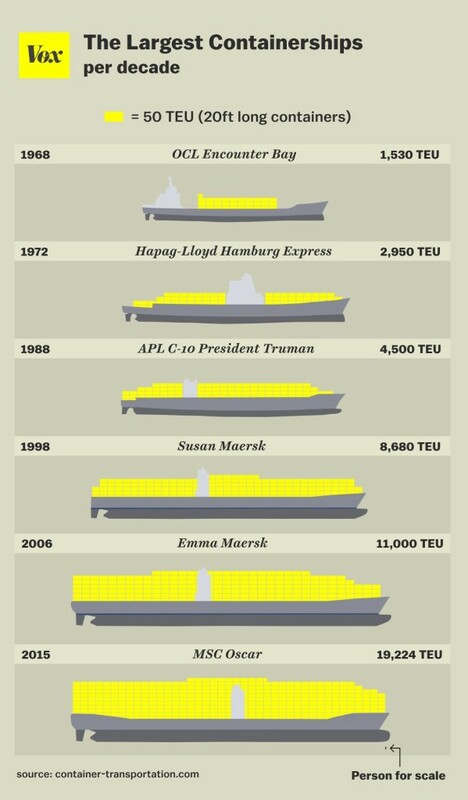 Before the world discovered container ships, transoceanic shipping actually cost so much that there was no financial reason for operators to transport goods around the various parts of the world. Nowadays, we have a different, cheaper scenario. When we combine this with all of the free-trade policies, we begin to understand that vendors in wealthy countries such as the U.S. can take full advantage of the cheap labor costs that are available abroad. This basically translates to the American consumers in the simple fact that the larger portion of goods like clothes, shoes, basketballs, flat-screen TVs, and even hair wax are being brought from outside the U.S. via the use of containers. The United States currently account for importing over 17 millions containers of cargo annually, with roughly 60% of that deriving from Asia. The country’s largest ports – Long Beach, Los Angeles, Savannah and Newark – each account for handling over 2 million containers on a yearly basis. Shipping companies have recently also started to ship bulk food products via the use of containers. And if we are to be frankly honest we have to mention that the above-mentioned record holder that is the MSC Oscar most likely will not hold the title for very long. 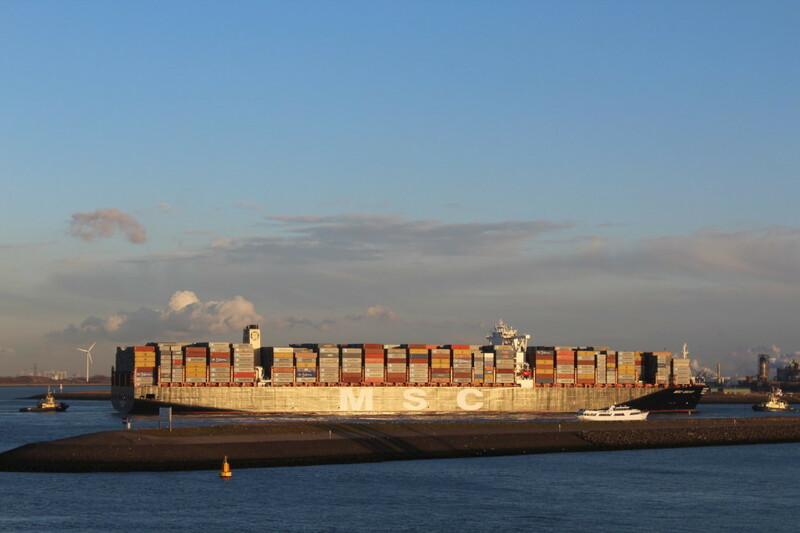 The previous record was set back in November by another ship – the CSCL Globe (it is an interesting fact that while it surpasses the MSC Oscar in both length and width it is not able to carry as many containers.) The Mediterranean Shipping Company (responsible for us having the MSC Oscar) launched the MSC Oliver, a sister ship of identical size, on March 31st, this year. According to most experts of the shipping industry it is fairly possible that we soon see vessels capable of carrying over 20,000 containers.